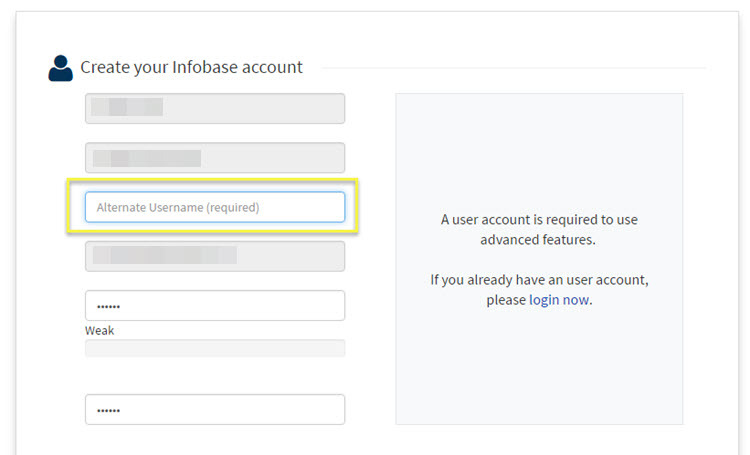 The Infobase Single Sign-On (SSO) supports an optional parameter called Alternate Username. This parameter allows your users to create a new user account, or merge an existing account they might have, with the user account being passed to the platform via an SSO URL you are using. This is particularly useful when your users sign in to a third party system and do not know the username they have on that system. With alternate username enabled, the first time a user clicks an SSO link from your portal, they will be redirected to the alternate username page. This is a ONE time process and once completed the user will never be asked to perform this interim step, unless they remove their alternate username from the User Profile section.